The 1st of June has arrived which means the new 2017-18 Annual Catalogue is now live. As mentioned previously I am offering product shares which means you can try out a bit of everything, without the huge cost of purchasing a full pack of each product. That way you can find your favourites with a smaller initial outlay. View the shares I have on offer by clicking the relevant link below. There you'll find out pricing details and what products are included in each share. Or you can visit my online Stampin' Up! Store to purchase any of these new and returning Stampin' Up! goodies. Would you like to get your hands on a physical copy of the new Catalogue? 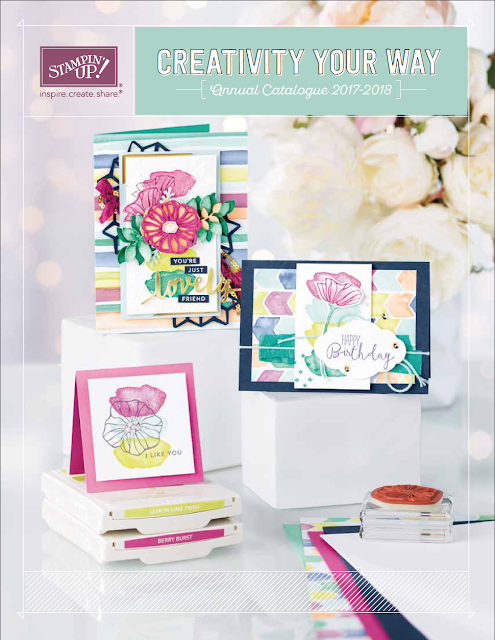 Customers who placed orders with me in April or during the 6 months prior, should have received their catalogue copy directly from Stampin' Up! during May. 1. Place an order via my Online Store and get a catalogue delivered with your new Stampin' Up! goodies. Just include a catalogue in your order (Item # 146117, $7.00 AUD) and I'll refund you the cost of the catalogue ($7.00). I'll contact you to organise your refund once I receive notification of your order.